The question is not whether an “Alien” can overcome a “Predator” (ignorant semantics, as the two non-human species in this film are both “aliens” and “predators”); the real battle is pitting the movie’s Audience against its interminable Padding scenes. Can – we – survive? With my leg bloodied from the onslaught and a gaping wound in my side, I struggled out the theater exit, leaving two friends gurgling in the seventh row – hey, I’m no jarhead – I make no empty promises to “leave no one behind”… If the subterranean walking scenes didn’t finish them off, the inane talking scenes did. AVP: ALIEN VS PREDATOR is a nippled Batsuit – a franchise gone too far. It fulfills its purpose of keeping 14-year-old boys off the street and thereby less likely to shoot up a school or get your daughter pregnant, which is small respite; all we can hope for – until the next over-breasted Lara Croft video game release or somnolent Harry Potter movie. But as adult entertainment – and let’s face it: present-day adults, not kids, are the demographic weaned on the ALIEN and PREDATOR movies – it is diversionary, but not involving; good but not great, glittering but no prize. An ancient pyramid is discovered beneath the snows of some snowy country, where Aliens are kept imprisoned in labyrinths, for Predators to send their teen warriors in and achieve predatorhood via slaughter. Sounds great on paper. Both ALIEN (1979) and PREDATOR (1987) were sui generis movies, the former, through canny screenwriting and an uncompromising lead heroine, spawned three above-average sequels while the latter spawned an adequate-bordering-on-lame sequel (Danny in lieu of Arnold?!). Now, like the HIGHLANDER franchise, the mythos of both creations is sullied to the level of soap opera and with the Marketeers wielding their pimp-witted power, no longer will any successive ALIEN or PREDATOR movies exude the mystery or excitement of their progenitors, but rather, bombastic, overblown CGI and gratuitously-tweaked explosions for the action-figure teenboy market. As a stand-alone movie – forget it! 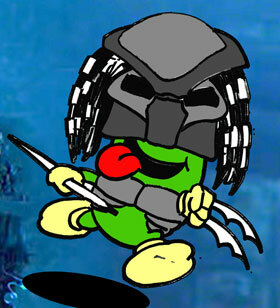 AVP’s existence is predicated on our cognizance of the last 25 years of these iconic monsters. Without that foreknowledge the very existence of these creatures and their interaction will appear contrived. The plot seems cobbled together from drafts made by 14-year-olds playing with their action figures (much like George Lucas writes his plots). The concept of the battling races at first seems mildly plausible, but then we realize the whole backstory is shoving square storyline into round plot holes and demystifying not one, but two rapacious extra-terrestrial cultures. Casting one’s senses back to those heady days of the original movies, our enjoyment was piqued precisely because their antagonists were inexplicable; they were truly… “alien.” Now they’re just Philo Beddoe in a barroom. Except for Lance Henriksen (renowned B-movie “That Guy”), all human characters are instantly forgettable, except for a guy whose cultured locution could easily get him mistaken for a black James Bond (Colin Salmon, who actually had a small recurring role in the three Brosnan Bond films) and the young female expedition leader (Sanaa Lathan), i.e. Black Ripley; in essence, humans are this movie’s McGuffin, for any agent could have unearthed the battle-pyramid and a text crawl could have explained the backstory of the Alien-Predator symbiosis. Only reason we meet humans at all in this film is to mayhap invest a modicum of interest in this tale which, literally, has nothing to do with our species. It’s a B-Actor hoedown: Sanaa Lathan and a cast of glorified extras. Henriksen’s role is anomalous: his character is familiar with Aliens (from ALIEN 3), yet when confronted by one, instead of becoming Mr. Corporation (as would be his character’s wont), he burbles incoherently with the rest of the B-Actors. Then when confronted by a Predator, instead of dollar signs cha-chinging in his eyes at the discovery of yet another alien species, he goes Rambo on it and gets, subsequently, dead. But I will leave that trite conundrum to the fanboys to clarify. Terming one species Alien and one Predator is a point of irritating contention for me; these terms only exist in our viewer-reality, for in the movie, the creatures are only superficially identified as “serpents” (Aliens) and “hunters” (Predators). The substitute terms are a dead giveaway: hunters are “noble”; serpents, well… do we need to extemporize on a well-trodden metaphor? From the outset, we are led a merry road by the film-makers to perceive the Predators as “good guys.” No surprise, for in being prejudicially human, we are prone to siding with the more anthropoid of the two aliens and ironically, the Predators assume the Arnold role in this movie – the musclebound “heroes,” as it were. The movie rationalizes, sensibly, that the Predators only try to kill our human B-actors to re-acquire what the B-actors stole – their weapons. Which puts paid to the movie’s tag-line, “Whoever wins – we lose.” Well, not exactly, for the Predators are portrayed as sentinels keeping the roistering Aliens at bay… So only if the Predators lose, we lose. And for the record, the “AVP” acronym is so IGNINTLY “skoolyard-bitchin” that it reeks of Marketeers grappling with the long-dead spirits of their nerd youth in pathetically trying to ramp up the street-cool of this geek-square movie. Writers: Jim Thomas, John Thomas, Paul W.S. Anderson, Dan O’Bannon, Ronald Shusett. Starring: Lance Henriksen, Sanaa Lathan, Ewen Bremner, Tommy Flanagan, Colin Salmon.